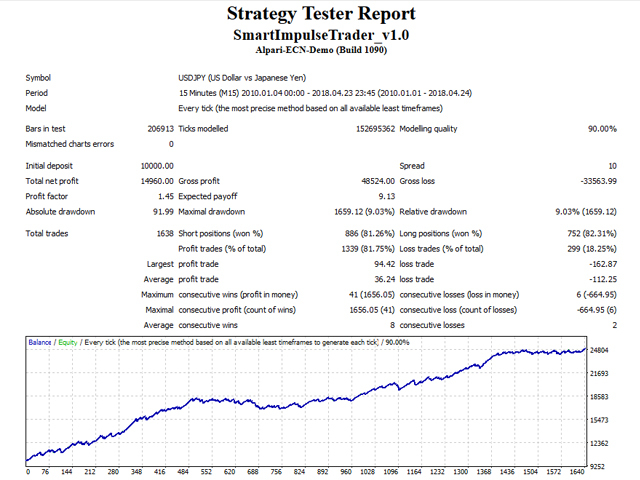 Smart Impulse Trader is an automated forex trading robot. The main idea behind this strategy is to detect the impulse and to open two trades at the same time and in the same direction. There are separate take profits for both trades: First_Trade_TP and Second_Trade_TP. When the first trade is closed with profit, then the robot sets take profit value to the second trade. The distance is equal to Second_Trade_TP parameter's value (in pips) from the close price of the first trade. For quick backtest, you can use Open price and M1 timeframe. If you want more precise backtest, then use Every tick and M15 timeframe. 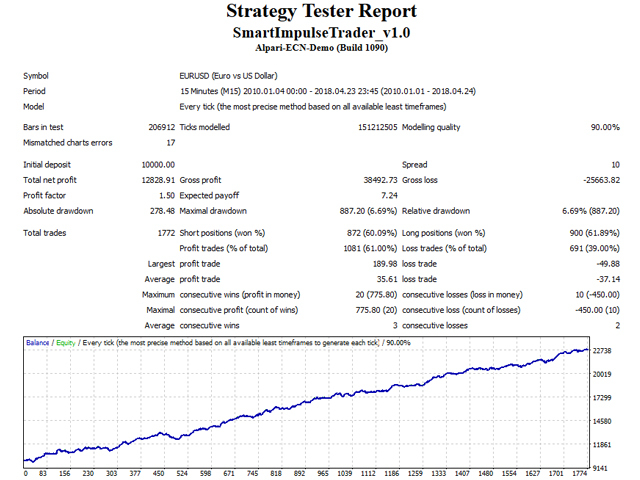 Stop_Loss, First_Trade_TP, Second_Trade_TP, Trading_Hours, ImpulseBarLenght, SecondStartTrail and SecondTrailStop. Optimize one or max two parameters at the same time for better results. The robot is optimized since 2010. The last 8 years are enough for optimization for such strategy. The results of the robot on earlier period could be poor. The GMT offset of your broker is very important and therefore please set it correctly. In case that you do not know how to set correct value for GMT, add a comment to the product or write me a message, and I will help. Max_Spread - maximal allowed spread for opening a new trade. Slippage - maximal allowed slippage when opening a new trade. Magic_Number_1 - magic number for the first trade. Magic_Number_2 - magic number for the second trade. 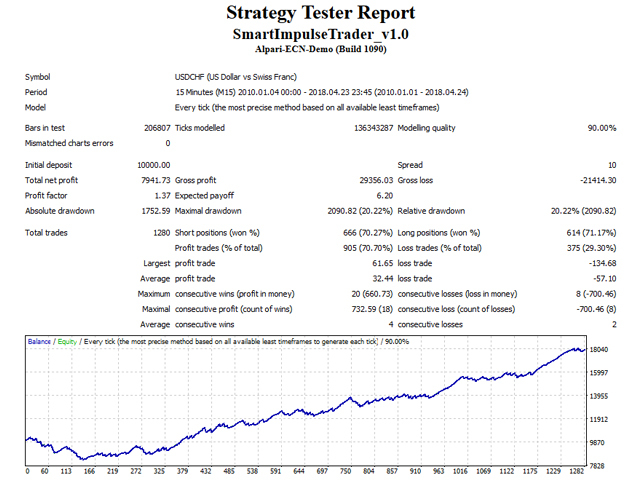 Stop_Loss - Stop Loss value in standard pips. The robot will close the trades when the loss is equal to Stop_Loss. First_Trade_TP - Take Profit value in standard pips. The robot will close the first trade when the profit is equal to First_Trade_TP. 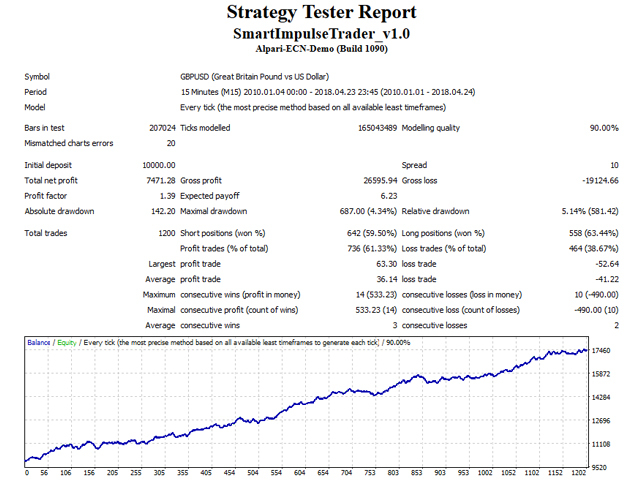 Second_Trade_TP - Take Profit value in standard pips. The robot will close the second trade when the profit is equal to First_Trade_TP + Second_Trade_TP. ImpulseBarLenght - length of the impulse needed for opening a new trade. BarTF - timeframe of the bars. Lots - fixed lots size. 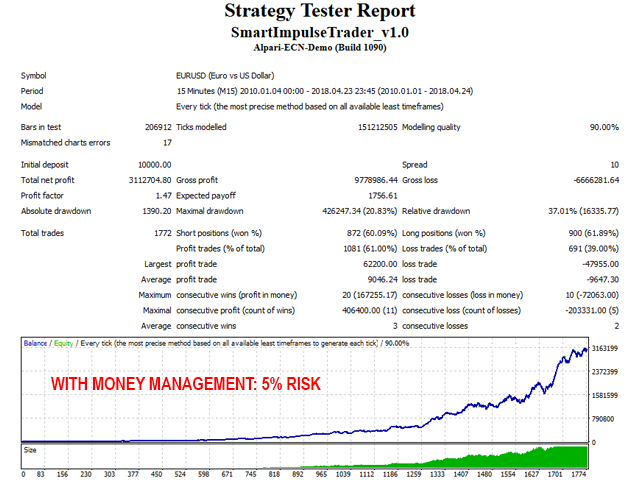 If you want to trade with fixed lots, you have to set Risk=0 and set a proper value to Lots parameter according to your account free margin. Risk - value in percents. When its value is greater than 0 (zero), the robot calculates the lots size automatically based on Risk value and account free margin. Loss_Recovery - loss recovery system. When enabled, the robot checks whether there are any previous losses. If there are, it starts to increase the lots size of next trades with small amounts. This way, it compensates the previous losses. 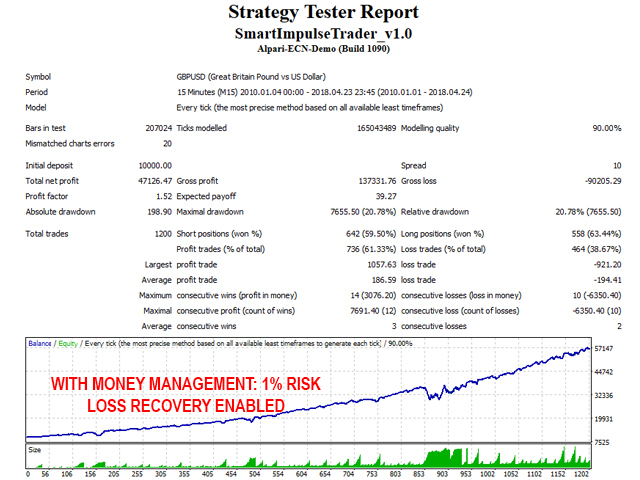 When the previous losses are compensated, the robot continues trading with normal risk. 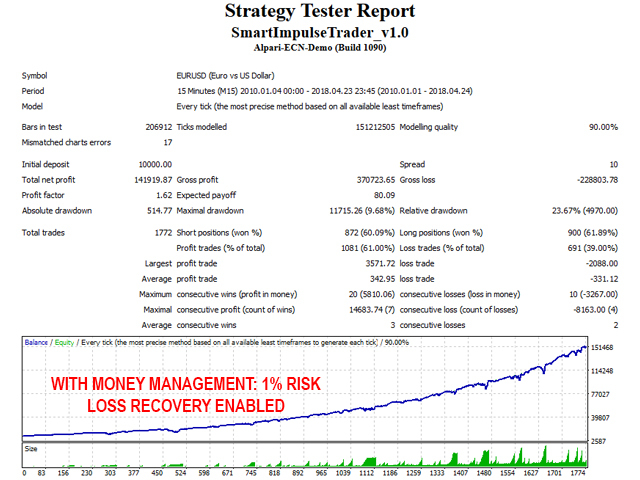 For correct recovery, the MM should be enabled: Risk > 0. Max_Recovery_Risk - maximum risk in percents, which will be used by the robot during recovery process. 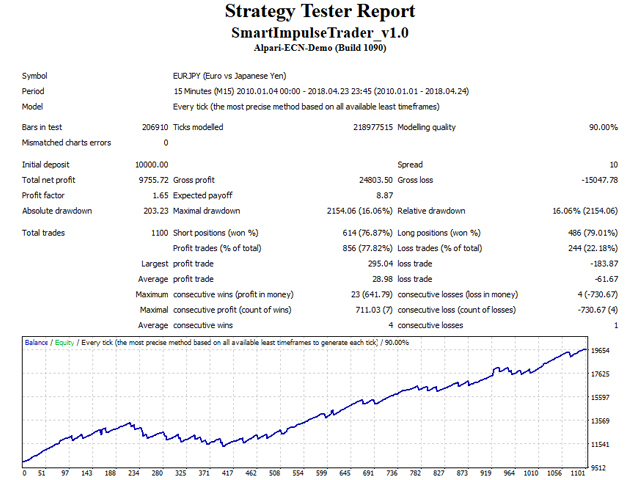 SecondStartTrail - when the profit of the second trade in pips is equal to SecondStartTrail, the robot will set trailing stop to the trade equal to SecondTrailStop value. 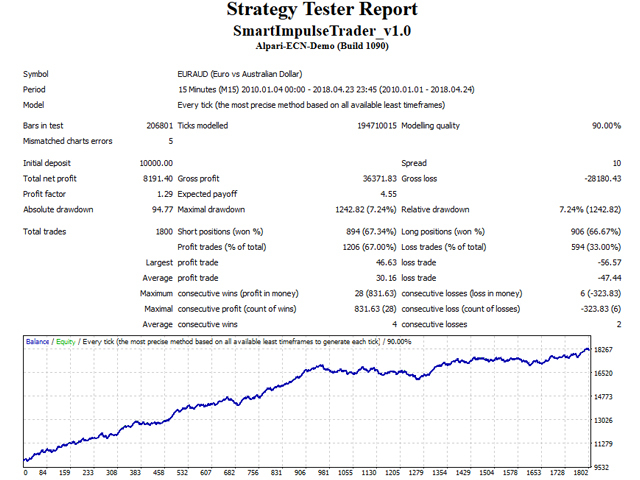 SecondTrailStop - value in pips for the trailing stop of the second trade. GMT_Offset - GMT offset of your broker. Always set the winter GMT offset of your broker. It is very important to be properly set. Otherwise, the robot may have bad results. DST - set TRUE if the broker shifts the GMT offset with +1 in Summer. Set FALSE if broker uses the same GMT offset the whole year. Very good, Asian scalper is better, but this is other amazing EA!!! 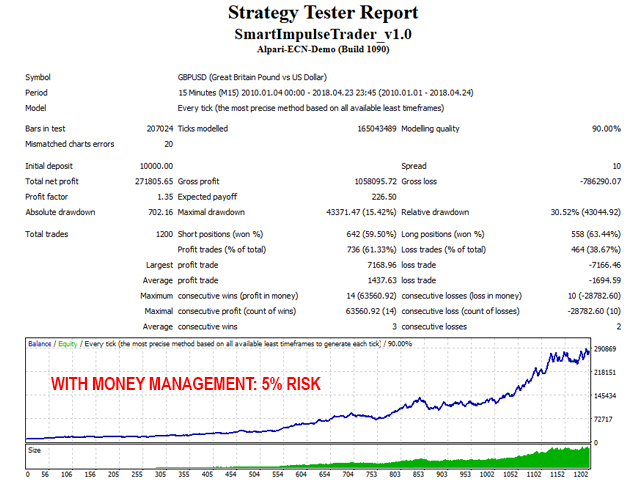 Modification in risk/lots calculation system of Smart Impulse Trader. Support for accounts with base currencies GBP, EUR and JPY is added.